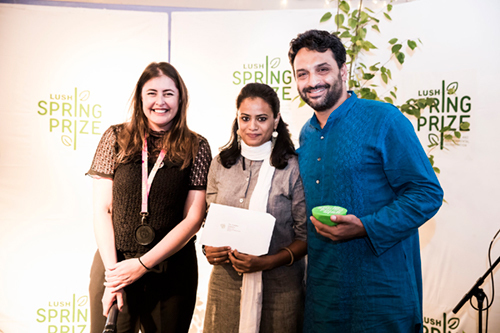 2015 Fellow Sid Rao (right) at the award ceremony for the Lush Spring Prize. In 2017, the Lush prize was awarded to 11 projects, totaling £200,000 in funding to support environmental and social regeneration. The winners demonstrate the variety of approaches that can be taken to create a more regenerative society: from restoring degraded landscapes to creating platforms that give a voice to marginalized communities. "The Lush Spring Prize is given to organizations that are trying to work in harmony with nature to revive damaged social and natural environments," said Sid. "Our organization, the Timbaktu Collective won in the Established Projects Category, which recognizes groups or organizations that demonstrate successful and inspirational work over more than five years. We intend to use the prize money to promote our work in various forums by mentoring individuals and organizations interested in setting up community led cooperatives to protect nature. And we intend to allocate a part of the money to the construction of an Wildlife Interpretation Center in the Kalpavalli Community Conservation Area where we are restoring and protecting Savannah grasslands. The center will serve as a hub for nature based education aim at rural children and youth." The Timbaktu Collective works for sustainable development in the drought prone Anantapur district of Andhra Pradesh (A.P.) in India. The Collective works in over 172 villages of Chennekothapalli, Roddam and Ramagiri mandals of Anantapur district, reaching and serving about 20,000 marginalized families. The Collective works with some of those most affected by chronic drought, unproductive land, unemployment and poor infrastructural facilities in the region. Among them are landless people and small and marginal farmers, with a special emphasis on women, children, youth and dalits.